The Atmos Astra 2 Vaporizer is a sleek and unique looking palm sized vape that is packed full of features that make enjoying your favorite dry blends on the go quick, easy, and efficient. Measuring in at only 4 inches long and about an inch thick, the Atmos Astra vaporizer is not going to even slightly slow you down while you're out and about. Hold it in your hand, put it in your pocket, throw it in your bad, no matter where you store it you will barely even be able to tell it is there. Don't let its small scale fool you though, this little vape is as tough as they come with a scratch resistant anodized aluminum shell and rubber bumpers on the corners to stop damage from unexpected falls. This protection is very important considering the OLED screen on the face of the vaporizer and the ceramic heating chamber within. The screen displays all the information you need at all times, including the current temperature that you adjust with the two face buttons (both the current temperature and your desired temperature) as well as your battery level so you aren't left guessing or have a session unexpectedly cut short. 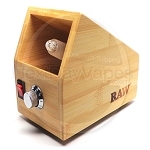 Inside you will find that the ceramic heating chamber is surprisingly large for how small the Astra vaporizer is. This ensures you multiple long sessions without having to stop and load it up repeatedly. When it is time to load up your favorite dry material into the Astra 2 portable vaporizer's ceramic chamber it is as simple as popping off the mouthpiece on top and dropping it right in. There are two mouthpieces included out of the box, a flat and short one that is a bit better for portability, and an additional small mouthpiece with a short glass tube so the vapor has time to cool down before inhaling. 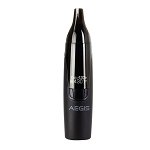 Even with the glass tube mouthpiece attached the Atmos Astra 2 vaporizer is still only as long as a standard cell phone, so it won't leave you feeling encumbered. 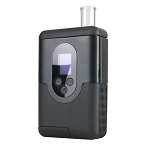 Everything the Atmos Astra 2 portable vaporizer offers in good looks, it doubles that in features and quality. This is a perfect hand held, palm sized vaporizer to be your travel companion throughout all four seasons. 12 points worth $12 will be earned when you buy this item.